Plaza de España (Spanish for Spain Square) is a large square, a popular tourist destination located in central Madrid, Spain at the western end of the Gran Vía. 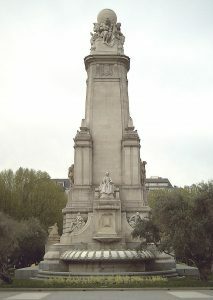 It features a monument to Miguel de Cervantes Saavedra and is adjacent to two of Madrid’s most prominent skyscrapers. Additionally, the Palacio Real (Royal Palace) is only a short walk south from the plaza. Right in the center of the square is the monument to Miguel de Cervantes, a sculptural group that was made at the same time as the urbanization of the square itself. Around the monument, a series of landscaped spaces were created for the enjoyment and rest of the passers-by. In front of the statue of Don Quixote and Sancho Panza, a pond of rectangular form is located that forms one of the most typical views of the Spanish capital, since just behind it see the buildings of Torre de Madrid and Edificio España. 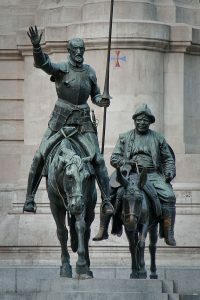 Initially, the statues of Don Quixote and Sancho Panza were located, approximately, in what is now the center of the pond, since it was later made. 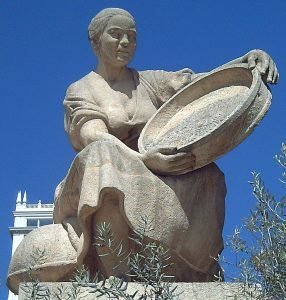 The constructive part of the monument is elaborated in granite, while the sculptural part was decided to be made in red stone from Sepúlveda (and some additions in bronze). Its accomplishment was carried out on the occasion of the third centenary of the publication of the second part of Don Quixote, in 1915, and which continued with the centenary of the death of the writer (1616), in 1916. The author of the project was the architect and sculptor Rafael Martínez Zapatero, who counted on the collaboration of Pedro Muguruza Otaño. The sculptures added were the work of Lorenzo Coullaut Valera. The figures that make up this emblematic monument have, on the one hand, a seated Cervantes and at the base of the monument, and under the feet of the writer, are the statues of Don Quixote and Sancho Panza. The set was finalized when the figures of Dulcinea and Aldonza Lorenzo were added, also characters of the Cervantes novel. Alluding to the universality of Don Quixote, the monument also contemplates the five continents, all of them reading the work of Cervantes. 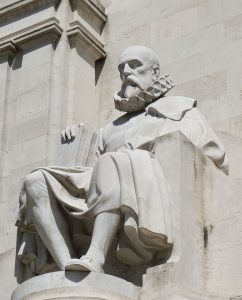 On the other side and above the fountains, is represented the Spanish Literature, dressed in period and holding a book with his right hand. The tree that predominates in the landscaping of the square is the olive tree, in homage to the La Mancha fields in the wanderings of Don Quixote and Sancho.